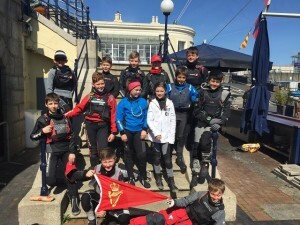 A cloudless May weekend with bright sunshine and North East Wind saw the RCYC Optimist Fleet gather at the Royal St George Yacht Club last weekend. 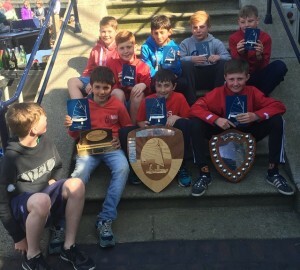 Having seen quite a few sailors move onto the Topper scene recently it was very gratifying to see so many of our sailors take part across the 48 strong Senior Fleet (including Aoife Byrne, Kate Horgan, Alfonso Moreno, Cathal and Killian O’Regan, Rory O’Sullivan, Harry Pritchard and Harry Twomey ), the 43 strong Junior Fleet (Patrick Bruen, Max Coveney, Michael Crosbie, Stephen Cunnane, Eoin Horgan, Anna Keal, Justin Lucas, Richard McSweeney, Jonathan O’Shaughnessy, Simon Pritchard and Jamie Venner). 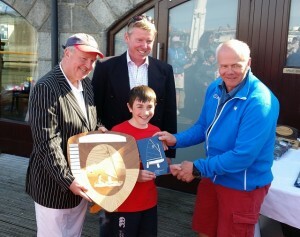 Other sailors associated by membership of the Royal Cork include Anna Carroll of Kinsale, Archie Daly of RStGYC and Diego Peletiero who all sail with us regularly, and in the 41 strong Regatta fleet we were represented by Emmet Lucas, Alanna Twomey and Charlie Venner. The Saturday started off with light 3-6 kt breeze with the juniors away first. RCYC got off to a flying start taking the first 5 spots (Michael, Eoin, Justin, Jamie and Simon) showing all that we have very good young sailing talent coming through. Saturday had 3 races completed in a dying breeze and increasing tide to the NW of the harbor and leading halfway through the championship was Michael Crosbie with a very solid 1,3,1 followed by Justin with a 3,2,8 then Jamie in 4th with Jonathan (with a win in race 2) and Eoin in 5th place. In the Senior fleet the RCYC were prominent with Diego leading then Rory, Cathal, Harry Pritchard and Aoife also doing well. Sunday had different conditions with a chop and a better breeze of occasionally 15 kts. Justin Lucas sailed beautifully to win the first 2 races and tie the championship on points with Michael. The last race was a somewhat tense affair but Michael came through to win race 6 and the Junior event, with Justin 4th to take overall 2nd. Jonathan improved to take overall 3rd on count back thus giving the Royal Cork an excellent 1,2,3 in Junior Gold. Our own Jamie Venner won Junior Silver with Archie Daly 2nd. 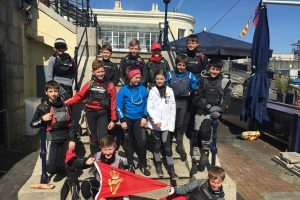 For our Junior sailors for some this was their first big event and mention must be made of Anna Keal who led the fleet around the 1st mark in Race one and finished a creditable 12th. Patrick Bruen and Eoin Horgan sailed really well in places which augers well for the future. The Seniors did well too with Alfonso taking 3rd overall with 4 races in the top 5, Rory in 4th with 4 races in the top 10, Diego slipped a little on the Sunday having been overall leader after the 1st day but still won Senior Silver. Harry Pritchard finished 2nd Senior Silver and 6th overall. 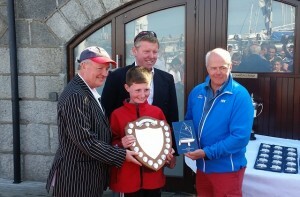 Cathal finished 10th showing the RCYC in a good light. Aoife in reputedly her last Oppie event sailed well to finish 12th with Killian and Harry and Kate further back but still all can be happy with their showing. Our Regatta sailors had a good event in smooth waters and a little breeze inside the harbour. Alana finished a creditable 6th with Emmet and Charlie enjoying themselves no end! Roll on Foynes in mid-June for the Connaughts.